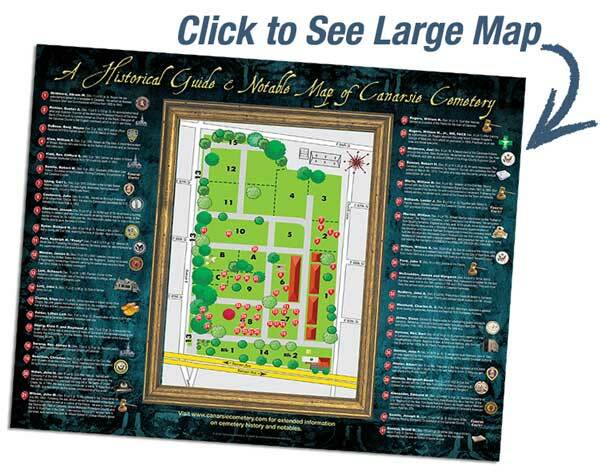 Canarsie Cemetery has a rich history which spans nearly two centuries. The following is a list of notable burials in the Cemetery. Many of the individuals on this list played an integral part in shaping Canarsie and the surrounding areas and we recognize them here. 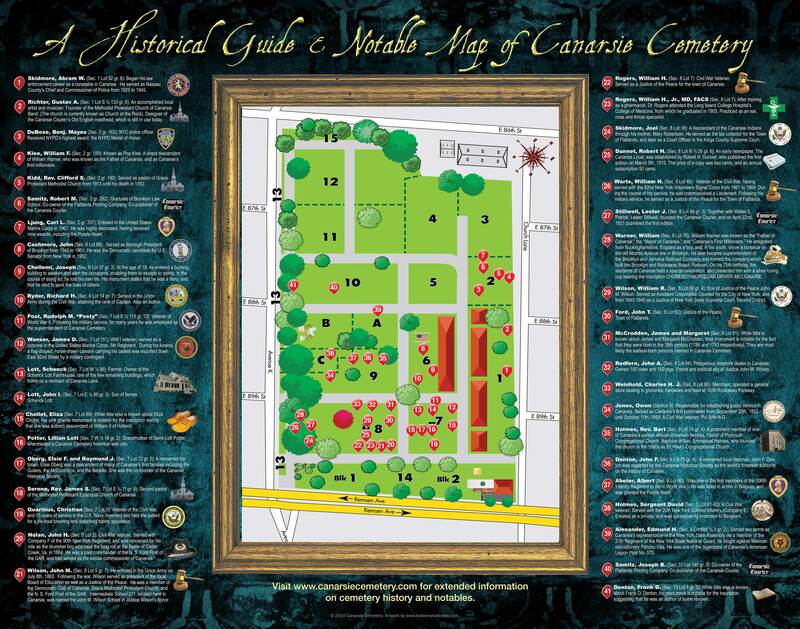 Special thanks to Canarsie historian, Ira Kluger, who compiled this information. 1. Abeler, Albert (Section 9): Mr. Abeler was one of the first to die as a member of the 106th Infantry Regiment, which was based at the armory at Bedford and Atlantic Avenues in Brooklyn. Abeler served overseas from May 10 to September 27, 1918. He was killed in action in Belgium, and was awarded the Purple Heart. 2. Abraham, Heinrich (Section 8): Proprietor of Abrahams Hall, later known as Heinrich’s Tavern, a well-known saloon and meeting hall located at 135 Conklin Avenue. The establishment was founded as Lehmann’s Hotel in the early 1860s, and during 1893-1894, while known as Willet’s Hotel, served as the temporary headquarters of the Town of Flatlands Police Department (building demolished). Mr. Abraham is interred with his wife, the former Mathilda Zinn. 3. Alexander, Edmund H. (Section A): An electrician by trade, Mr. Alexander operated an electrical supply store near the Canarsie shore. Alexander, a Republican, served two terms as Canarsie’s representative in the New York State Assembly. As a member of the 27th Regiment of the New York State National Guard, he fought against Mexican revolutionary Pancho Villa. In 1917, he enlisted in the United States Army, and served until 1918, when World War I ended. He was one of the organizers of the Canarsie American Legion Post No. 573, and served as one of its first commanders. Mr. Alexander is interred with his wife, the former Anna Cassin. 7. Blatz, Frank S. (Section 8): Merchant. Proprietor of a stationery store located at 126 Conklin Avenue (building extant). It is believed that the Canarsie Weekly, an early local newspaper, may have been published in this shop in 1904. He is interred with his wife, Pauline R. Blatz. 10. Bradner, Frank Wm., M.D. (Section 2): Born in Cleveland, Dr. Bradner graduated from the Bellevue Hospital Medical College in 1889, and practiced medicine in Brooklyn for more than half a century. Prior to his retirement, he served as a visiting physician at Kings County Hospital. Dr. Bradner had been active in the National Guard, serving with the 245th Coastal Artillery (Harbor Defense), Medical Department Detachment, and had attained the rank of major. At the time of his death, he was a resident of Canarsie. 11. Bullwinkel, Peter L. (Section A): Born 1859 in Hannover, Prussia, Germany. Operated a blacksmith shop in conjunction with Bullwinkel’s general store at what is now Bedell Lane and East 92nd Street, and served as a member of the Flatlands Volunteer Firemen’s Association. He was later appointed as a paid member of the municipal fire department, and served in this capacity for 28 years. Mr. Bullwinkel is interred with his wife, the former Minnie Stelljes. 13. Caro, Ned (Section 7): Ned Caro served as the spiritual leader of The Canarsie Shotokan Karate Club since its inception in 1961. He was a veteran of World War II. Mr. Caro owned and operated Ned’s Tavern in a late 19th century building at 1431 Rockaway Parkway (building extant). He began studying karate in the 1950s, and eventually reached the rank of Fourth Degree Black Belt. His love of both community and karate led to the creation of the Canarsie Shotokan Karate Club in 1961. Always diligent with his martial arts training, Mr. Caro continued training at the Club until the age of 88, just before his passing in March of 2010. His black granite monument is notable for the beautifully engraved portraits of Mr. Caro and his late wife, Rose, with whom he is interred. 14. Cashmore, John (Section 6): John Cashmore served as Borough President of Brooklyn from 1940 to 1961. He was the Democratic candidate for U.S. Senator from New York in 1952, losing to the incumbent Republican, Irving McNeil Ives. He served as a member of the New York Democratic State Committee from 1938 to 1944, and was a delegate to the Democratic National Convention from New York in 1948, 1952, 1956 and 1960. Prior to entering politics, Cashmore was an aide to the general manager of the New York Edison Company and a furniture manufacturer. He is interred with his wife, Edyth Tenny Cashmore, and their son, James John Cashmore, who was an attorney. Following James Cashmore’s divorce from his wife, the former Sandra Campbell Gaston, she married singer-songwriter Harry Chapin. 15. Chellemi, Joseph (Section 6): Although nothing further is known about Joseph Chellemi, his monument is notable for the inscription stating that he was a hero, and that he died to save the lives of others. 16. Chollet, Eliza (Section 7): While little else is known about Eliza Chollet, her pink granite monument is notable for the inscription stating that she was a direct descendent of William II of Holland. 18. Denton, Daniel (Section 9): Served with Company D of the 127th New York Infantry, a Civil War Regiment raised in New York City and Long Island. The regiment, which was also known as “The Monitors,” was in service from September 1862 through June 1865. 19. Denton, Frank D. (Section 13): While little else is known about Frank D. Denton, his monument is notable for the annotation indicating that he was an author, and for the poignant inscription selected by his sister, Rose. John Denton, as some of you might know, was the scribe who for years penned the “Little Old Canarsie” column for the Canarsie Courier. He was also mentor to current community historian Ira M. Kluger and the other officers of the Canarsie Historical Society for many years, in addition to serving as the community’s official historian. John Denton was born in Canarsie in 1899. He attended P.S. 114 and P.S. 115 when they were the epitome of the little red schoolhouse, and worked with his father and brothers digging clams and oysters from the then fertile flatlands and the bay shore. He professed a love for the things here, the things that were, so much that he published a running chronicle of them in the Canarsie Courier, which came into existence in 1921. To write a biography of John Denton would be to write a history of Canarsie itself, citing the early days of Golden City Park, and the American Theater, which showed motion pictures featuring Mary Pickford and Charlie Chaplin, and which, during the 1920s, was managed by Denton. Many years later he would operate a Motor Vehicle Service Bureau office at East 92nd Street and Flatlands Avenue, in the very same building where the movie theater was housed. In his off-hours, John would meticulously print by hand column after column of memories for publication in the Courier, thus becoming Canarsie’s bona fide official historian. When community residents wanted to find some information about the history of Flatlands or Jamaica Bay or their schools, they would simply visit John and he’d tell them stories for hours on end, using his excellent memory to recall people and places long forgotten. John Denton was buried in Canarsie Cemetery, where a stone was placed, so that we may remember our historian just as he remembered, with complete accuracy, all of us. In a fitting tribute, on October 25th, 2010, after 25 years of advocacy by the Canarsie Historical Society, the City of New York co-named the portion of East 92nd Street (Canarsie’s Old Main Road) between Flatlands Avenue and Avenue J John F. Denton Way. 21. DuBose, Benj. Mayes (Section 2): Benjamin Mayes DuBose was born in Manning, South Carolina in 1880. At age 19 he joined the Navy to fight in the Spanish-American War and then in the Philippines. He was stationed at the Brooklyn Navy Yard when he was discharged in 1904, and he decided to make Brooklyn his home. He became a NYC Police Officer, and in 1913 he was badly hurt during the “Barber Riots,” and received the NYPD’s highest award, the NYCPD Medal of Honor. In 1916 he was decorated again for saving a four year old boy in a runaway horse-drawn carriage. As reported in the Brooklyn Daily Eagle, “Officer DuBose jumped from a car when alongside the horse, making a flying leap to grab the horse around the neck.” He was one of the city’s very first motorcycle officers, but gave that up after being hit by a taxi. In 1922 he purchased a new home on East 95th Street (between Avenues K & L), and while living in Canarsie, he was assigned to patrol Barren Island for several summers. He was given an old abandoned house on the island, where he lived full-time with his family, and patrolled the island on a bicycle. During the busy summer months, his was the only law enforcement presence on the island. He retired in 1938 as a Sergeant. He is interred with his wife, the former Josephine Barry. 22. DuBose, Horace “Howie”: Raised in Canarsie and attended Public School 115. He was a Technical Sergeant stationed in the Pacific during World War II, and he was among those who fought in the Battle of Palauli in the Philippines. It was predicted the island would be secured within four days. However, due to Japan’s well-crafted fortifications and stiff resistance, it lasted over two months and became one of the bloodiest battles in World War II. He is interred with his wife, Mildred DuBose. 23. Dunnet, Robert H. (Section 8): Robert Dunnet was responsible for the establishment of an early newspaper known as The Canarsie Local, the first edition of which was published on March 5th, 1915. The price of a copy was two cents, and an annual subscription 50 cents. The masthead indicates the publication’s address as 409 Pearl Street, in Manhattan. While little is known about the Canarsie Local, some information regarding the publisher himself is available. On June 7, 1881, Robert Hancock Dunnet was born to Donald and Laura Emma (Vyse) Dunnet. When Laura’s mother died in 1898, Laura inherited land in Canarsie, Brooklyn, and had a house built at East 89th St. and Farragut Road, then also known as Avenue F. Thus the Dunnet Family relocated to Canarsie, where Donald became actively involved in the Methodist Protestant Church, playing the organ and singing in the choir. Donald, a Scottish immigrant, was employed by the publisher D. Appleton & Co. as a compositor, and at the time of his death he was described as a proofreader. He was a member of the Typographical Union, Local # 6. Robert apparently decided to follow his father into the typographic industry, and thus he founded the Canarsie Local. He is interred with his wife, the former Emma Louise Krin. 25. Ford, John T. (Section 8): Justice of the Peace, Town of Flatlands. Like many of the early Justices of the Peace, Justice Ford was not formally schooled in the law, and supported himself by working as a bayman. According to a Brooklyn Daily Eagle article published in the Brooklyn Daily Eagle in 1892, Justice Ford was noted for his politeness towards attorneys who appeared to him, and would address them as Your Honor. He is interred with his wife, the former Elizabeth Eldert. 26. Fortmeyer, Claus (Section C): Born in Ilienworth, Hanover, Germany. Merchant. Together with his brother, Henry N. Fortmeyer, he operated a meat market at what is now 9404 Avenue L. (Demolished 1939.) He later withdrew from the partnership with his brother, and operated a well-known candy store/lunchroom at 1450 East 92nd Street, adjacent to P.S. 115. (Building extant.) He is interred with his wife, Elizabeth Fortmeyer. 27. Fortmeyer, Henry N. (Section 8): Born in Ilienworth, Hanover, Germany. Merchant. Brother of Claus Fortmeyer. Operated a meat market at what is now 9404 Avenue L. (Demolished 1939.) He is interred with his wife, Lenora Fortmeyer. 28. Fortmeyer, Peter W. (Section 8): Born in Germany. Merchant. Brother of Claus and Henry Fortmeyer. Operated a grocery store at what is now 9402 Avenue L. (Demolished 1939.) He is interred with his wife, Luella Fortmeyer. 29a. Frole, Joseph (Section 14): A United States Navy Veteran, during World War II, Joseph M. Frole, Sr. served as Ship Serviceman on board the USS O’Hare DD-889, and was an East Coast, “Atlantic” serviceman. Joseph Frole’s last name is missing from the Lapolla Family headstone marking the plot where he is interred. Joseph Frole was laid to rest next to his mother, Florence Frole Lapolla, who had remarried into the Lapolla family and who, upon her passing in January 1969, was laid to rest in the Lapolla family plot. When Joseph Frole passed away on November 1st, 1969, he was laid to rest in the Lapolla family plot, because it was believed that he would have wanted to be buried with his mother. His name is displayed on the Lapolla headstone as “Joseph M. Lapolla”, without any mention of his correct surname, Frole. 30. Groenert, Rev. David H. (Section 7): Served as pastor of First German Presbyterian Church, Elizabeth, NJ. 31. Guiler, Richard (Section 8): Born in Germany. Merchant. Believed to have been Canarsie’s first butcher, and to have operated a meat market at 89 Conklin Avenue (building extant). He is interred with his wife, the former Sophia Hemelman. 32. Harvey, Harold A. (Section 7): An English immigrant. Was employed in a shoe repair shop owned by his brother, Herbert Harvey, at what is now 72 Conklin Avenue (building extant). He is interred with his wife, Rachel Harvey. 33. Holmes, Rev. Bert (Section 9): A prominent member of one of Canarsie’s earliest African-American families. Pastor of Plymouth Congregational Church. Nephew of Rev. Jeremiah Holmes, who founded the church in the 1880s as St. Paul’s Congregational Church. He is interred with his wife, Ethel Holmes. 34. Holmes, Sergeant David (Section 8): A Civil War veteran. Served with the 20th New York Colored Infantry (Company E). Enlisted as a private, and was subsequently promoted to sergeant. 36. Husmann, Henry H. (Section 14): Born in Ottendorf, Hanover, Germany. Operated Husmann’s Music Hall and Hotel at the Canarsie Shore. He is interred with his wife, Ida Hussman. 37. Ingrassia, Daniel and Peter (Section 8): While little is known about Daniel and Peter Ingrassia, this black granite monument is notable for the etching of a steam locomotive pulling a train. 41. Kidd, Rev. Clifford S. (Section 2): Served as pastor of Grace Protestant Methodist Church (currently known as Church at the Rock) from 1913 until his death in 1952. Rev. Kidd was a native of Bridgeton, New Jersey, and graduated from Western Maryland College in 1901. Before coming to Canarsie, Rev. Kidd held pastorates in Asbury Park and Manasquan, New Jersey. He served for several terms as president of the Eastern Conference of Methodist Protestant Churches. Rev. Kidd was survived by his wife, the former Linda Turner, six sons, and four daughters. He is interred with his wife, who died in 1954. 42. Klee, William F. (Section 2): Known as Pop Klee. A direct descendent of William Warner, who was known as the Father of Canarsie, and as Canarsie’s first millionaire. Operated a well-known barber shop and pool hall at 1443 East 94th Street (building extant). It is believed that the business was founded circa 1912, and that the building dates back to the time of the Civil War. 43. Klee, William L. (Section 7): Son of William F. Klee. Converted the family business from a barber shop and pool hall to a fishing tackle store and pool hall, and continued to operate it until his death in August of 1995. 44. Kopf, John N.: Prominent local merchant. Operated a general store/grocery on East 92nd Street near Church Lane, adjacent to the Methodist Protestant Church of Canarsie. Later relocated to Sheepshead Bay, where he operated a successful grocery business. 45. Kopf, Margaret Catherine Butecke: Wife of John N. Kopf. Daughter of Henry M. Butecke Sr. & his first wife, Anna Maria Schluer Butecke. Brother of prominent local merchant Henry Butecke, who operated a well-known general store/grocery at 9501 Avenue L (building extant). 46. LaPolla, Florence (Section 14): Local midwife. Practiced at 202 Conklin Avenue (building demolished). 47. LaPolla, James J. (Section 14): Born in Italy. Local undertaker. Husband of Florence LaPolla. Co-founder of the undertaking firm of Bacigalupo and LaPolla at 202 Conklin Avenue, AKA 1480 Rockaway Parkway (building demolished). Following the dissolution of the partnership, James LaPolla continued the business as the LaPolla Funeral Home. 48. Lott, John I. (Section 7): Son of farmer Schenck Lott. Committed suicide by hanging himself from a tree at Canarsie Lane and Foster Avenue, presumably due to marital difficulties. It is interesting to note that although he has a double headstone, which is inscribed, “My Beloved Husband,” half of the monument remains uninscribed, suggesting that his wife was never interred next to him, as was intended when the monument was purchased. 49. Lott, Schenck (Section 7): Farmer. Owner of the Schenck Lott Farmhouse, one of the few remaining buildings, which fronts on a remnant of Canarsie Lane. 53. McCrodden, Elmer A. (Section 6): Local plumber. Maintained a plumbing shop at 91 Conklin Avenue (building extant.) Served as superintendent of the Sunday School at the Methodist Protestant Church of Canarsie (currently known as Church @ the Rock). 54. McCrodden, James and Margaret (Section 8): While little is known about James and Margaret McCrodden, their monument is notable for the fact that they were born in the 18th century (1786 and 1793 respectively). They are probably the earliest-born persons interred in Canarsie Cemetery. Their remains were removed to their present location from the old town cemetery adjacent to the Methodist Protestant Church of Canarsie (currently known as Church @ the Rock). 55. McKee, John (Section 14): Husband of Viola DuBose, daughter of Benjamin Mayes DuBose. He played with the Tex Ritter Band, and was a retired New York City Corrections Officer. 56. Morrison, John A. (Section 1): born May 15, 1849. Enlisted at age 16 in the 56th NY National Guard on April 5, 1865. Died February 1940 at age 90. 57. Murray, Norman (Section A): Husband of Virginia DuBose, daughter of Benjamin Mayes DuBose, to whom she was introduced by her brother, Howie DuBose a fellow soldier at Fort Hancock. During World War II, he served in Europe and was with the very first group to liberate the infamous Dachau Concentration Camp. While fighting in France, he earned the Bronze Star. It is notable that he has two monuments, one of which is a military marker. 59. Oberg, Elsie F and Raymond J. (Section 7): A renowned historian, Elsie Oberg was a descendent of many of Canarsie’s first families including the Guilers, the McCroddens, and the Bedells. She was the co-founder of the Canarsie Historical Society, and served as its co-president until her death in 2000. Her husband, Raymond Oberg, was a staunch supporter of the Canarsie Historical Society, and, at the time of his death, served as its vice-president for finance. 60. Pagenstecher, Albrecht (Section 9): An early Canarsie pharmacist. 61. Pelocke, Albert C. (Section C): A member of one of Canarsie’s prominent, early African-American families. As successor to Sebastian Bund, he operated a general store in the vicinity of Rockaway Parkway and what is now Avenue J (building demolished). 62. Post, Rudolph M. “Posty” (Section 7): Rudolph Post was a veteran of World War II. Following his military service, for many years he was employed as the superintendent of Canarsie Cemetery. Upon his retirement, he relocated to Bucks County, Pennsylvania. However, he maintained his ties with Canarsie, and upon his death, his remains were returned to Canarsie for interment in Canarsie Cemetery. 63. Potter, Lillian Lott (Section 7): Grandmother of Gene Lott Potter, who created a Canarsie Cemetery web site. She served as the inspiration for a companion site, which Gene Lott Potter created, the “Lott Family in Brooklyn”, which is dedicated to her memory. 64. Quaritius, Christian (Section 7): Merchant; operated a general store at 132 Conklin Avenue (building extant). Veteran of the Civil War, and 15 years of service in the U.S. Navy. Invented and held the patent for a life-boat lowering and detaching safety apparatus. Founding member and deacon of German Evangelical Reformed Church of Canarsie (presently known as the Reformed Church of Canarsie). 67. Richter, Gustav A. (Section 1): An accomplished local musician, composer and orchestra leader. Inaugurated the 23rd Regiment Band in Brooklyn, and founder of the Dutch Reformed Church Band in Canarsie. Served as bandmaster for both of these outfits, as well as for the Manhattan Beach Park Band and the band that played at the “Rocking Chair Movies” at Brighton Beach. Also an accomplished artist, Richter was self-employed as a sign painter, and maintained a shop at various locations in Canarsie, including 1441 Rockaway Parkway and 9203 Flatlands Avenue. Designer of the Canarsie Courier’s Old English masthead, which is still in use today. 68. Rogers, William H. (Section 8): Veteran of the Civil War. Served as a private in Company A of the 84th New York Regiment, and was later promoted to sergeant in Company H of the 13th Regiment. He also served with 14th NYVI. He was wounded at the Battle of Bull Run. He later served as a constable, and as Justice of the Peace for the Town of Flatlands, and, as the successor to Adolph Feise, operated a hotel and saloon at the corner of Conklin Avenue and East 92nd Street. This building, while occupied by Feise’s Hotel in the 1860s, was the headquarters of the Democratic Party in Canarsie, and is believed to be the first site where medicine was practiced in Canarsie. In 1887, former Justice Rogers was the victim of an attempt on his life, but was spared because his assailant’s revolver failed to fire. Justice Rogers is interred with his wife, the former Phebe Matthews. It is notable that he has two monuments, one of which is a military marker. 69. Rogers, William H., Jr., MD, FACS (Section 8): Son of Justice William H. Rogers. After training as a pharmacist, Dr. Rogers attended the Long Island College Hospital’s College of Medicine, from which he graduated in 1905. He initially practiced as an otolaryngologist in the Fox Theatre Building at 1 Nevins Street in Downtown Brooklyn. By 1934, he relocated his practice to 413 Ovington Avenue in the Bay Ridge section of Brooklyn. In 1930, he attained fellowship in the American College of Surgeons. His hospital affiliations included the Brooklyn Eye and Ear Hospital, Victory Memorial Hospital, Norwegian Hospital, and the Bay Ridge Hospital. He is interred with his wife, Mabel Elizabeth Rogers. 70. Rumph, Jacob C. (Section 7): Local blacksmith. Maintained a shop at 92 Conklin Avenue (building extant). 71. Ryder, Harry C. (Section 6): Son of Civil War veteran Captain Richard H. Ryder. Merchant; dealer in house furnishings. Maintained a store at Conklin Avenue and East 93rd Street (building demolished). Sold the business to Daniel J. Fullerton, who, concentrating his focus on the line of caskets, which, at the time were sold in furniture stores, converted the business to an undertaking establishment. 72. Ryder, Richard H. (Section 6): Served in the Union Army during the Civil War (Mustered in 87th infantry, October 15, 1861; transferred to 40th infantry, September 6, 1862; mustered out, June 5, 1863; mustered in 13th artillery, July 16, 1863; transferred to 6th artillery, July 18, 1865; mustered out, August 24, 1865), attaining the rank of Captain. Author of The Village Color-Bearer, Together with a Story Of a U.S. Life-Saving Service Keeper. Canarsie’s Public School 114 was named the Ryder Elementary School in his honor. 73. Salzmann, J. Charles (Section 9): Merchant; butcher. Owned and operated a store located on Skidmore Lane and East 96th Street (building demolished). Served as a member of the Flatlands Volunteer Department. He is interred with his wife, Anna C. Salzmann. 75. Samitz, Robert M. (Section 2): Graduate of Brooklyn Law School. Co-owner of the Flatlands Printing Company. Co-publisher of the Canarsie Courier. Following Joseph Samitz’s death in 1981, Robert Samitz became the co-publisher of the Canarsie Courier, together with his wife, Mary, a position, which he held until his death. He is interred with his parents, Bartholomew and Adele Samitz. 76. Savage, James (Section 14): Believed to have been Canarsie’s first florist. Held numerous positions in the Town of Flatlands government, including Town Clerk, Justice of the Sessions, and Justice of the Peace. Served as the Assistant Foreman of the Flatlands Volunteer Fire Department’s Engine Company No. 1. 78. Seaman, Erastus W. “Webb” (Section 8): Prominent Canarsie oyster dealer. Maintained a place of business on Indian Creek until 1920, when the taking of oysters from Jamaica Bay was banned due to pollution. Also owned a general store (grocery and meat market) on E. 93rd St. near Schenck Avenue, near the Canarsie shore. Served as a juror in the trial of John Redfern. 79. Serene, George W. (Section 7): An early Canarsie undertaker. Although he was, in certain contexts, referred to as Rev. Serene, it is unclear as to whether he was actually an ordained minister. Active in Republican politics in Canarsie. 80. Serene, H. W. (Section 8): Undertaker. In 1905, he founded the undertaking firm of Harry W. Serene and Son, Inc., which was located at 9229 Flatlands Avenue (building extant), and which continued to operate into the 1970s. Harry Serene was a veteran of the Spanish-American War, and served as a member of the local draft board here in Canarsie. 81. Serene, Rev. James S. (Section 7): Second pastor of the Methodist Protestant Episcopal Church of Canarsie (now Church at the Rock). Like most pastors of that time, he was unsalaried, and, therefore, supported himself by working as a carpenter. It is believed that his employment as a carpenter may have led the Serene family into the undertaking business. Rev. Serene’s wife supplemented his income by working in the fields, picking peas. 82. Serene, Mary A. (Section 7): Daughter of prominent Canarsie merchant and postmaster Isaac Skidmore. Wife of George W. Serene. Following George Serene’s untimely death, Mary Serene operated her own undertaking establishment at various locations in Canarsie. Her last location was 9520 Flatlands Avenue (building extant). 84. Skidmore, Abram W. (Section 1): Began his career as a constable in Canarsie prior to the establishment of the Town of Flatlands Police Department, which took place in 1893. His monument is notable for the inscription indicating that he served as Nassau County’s Chief and Commissioner of Police from 1925 to 1945. He is interred with his wife, Emily B. Skidmore. 85. Skidmore, Joel (Section 8): It is believed that Joel Skidmore was a descendent of the Canarsee Indians through his mother, Mary Robertson. (He was not a full-blooded Canarsee Indian, the last full-blooded Canarsie Indian having died in 1830.) He served as the tax collector for the Town of Flatlands, and later as a Court Officer in the Kings County Supreme Court. He is interred with his second wife, the former Mary Ann Seaman. 86. Smalley, Abbert (Albert) (Section 9): Veteran of the Civil War. Served 1861-1863 as a corporal, Company F, 90th New York Infantry. 87. Stillwell, Lester J. (Section 8): Together with Walter S. Patrick, Lester Stillwell, founded the Canarsie Courier, and on April 22nd, 1921 published the first edition. At that time, he resided at 1226 East 92nd Street (building extant). Stillwell later relocated to New Jersey, where he became an elected official. However, he maintained his ties with Canarsie, and upon his death, his remains were returned to Canarsie for interment in Canarsie Cemetery. He is interred with his wife, Natalie Stillwell. 88. Strassner, Frederick “Fritz” (Section C): Merchant; operated a general store at East 92nd Street and Skidmore Lane. Successor to Isaac Skidmore, whose general store served as Canarsie’s recruiting station during the Civil War. 89. Taylor, William H. (Section 9): Prominent local merchant and businessman. Operated a meat market on Skidmore Lane, as well as an express company. 90. Trochelmann, Jacob (Section 8): Born in Lamstedt, Niedersachsen, Germany. Emigrated to the United States in 1920. Merchant; operated a general store known as the Halfway House, selling groceries and liquor at 1539 Rockaway Parkway (building demolished), corner of Truckleman’s Lane. Truckleman’s (a corruption of Trochelmann’s) Lane was named for him. He is interred with his wife, the former Anna Marie Hildenbrandt, and their daughters, Elizabeth and Meta, who operated a candy store alongside the Halfway House. 92. Wanser, James D. (Section 7): WW I veteran; served as a corporal in the United States Marine Corps, 5th Regiment. According to the late historian, John Denton, Wanser was 20 years old when he died overseas of an unknown disease. When his remains were returned to the United States for a military funeral, all of the veterans from Canarsie turned out, including several who served in the Civil War. During the tribute, a flag-draped, horse-drawn caisson carrying his casket was escorted down East 92nd Street by a military contingent. 93. Warner, William (Section 8): William Warner was known as the “Father of Canarsie,” the “Mayor of Canarsie,” and ” Canarsie’s first millionaire.” He emigrated from Buckinghamshire, England as a boy, and, in his youth, drove a horsecar on the old Atlantic Avenue line in Brooklyn. He later became superintendent of the Brooklyn and Jamaica Railroad Company, and, in 1865, with DeWitt C. Littlejohn, he formed the company, which built the Brooklyn and Rockaway Beach Railroad. The company also operated two hotels at Canarsie, and two steamboats, which ran between Canarsie and Rockaway Beach until 1890. The famed Golden City Amusement Park was built by Warner’s Canarsie Amusement Company in 1907, on a 9-1/2 acre plot along Jamaica Bay adjacent to Canarsie Landing. On his 75th birthday, the residents of Canarsie held a special celebration, and presented him with a silver loving cup bearing the inscription CHOREBOY-HORSECAR DRIVER-MILLIONAIRE. He is interred with his wife, Anna Warner. Their beautiful monument stands as a testament to their status in the Canarsie community. 94. Warts, William H. (Section 8): William Warts was a veteran of the Civil War, having served with the 82nd New York Volunteers Signal Corps from 1861 to 1864. During the course of his service, he was commissioned a lieutenant. Following his military service, he served as a Justice of the Peace for the Town of Flatlands. Following the annexation of the Town of Flatlands by the City of Brooklyn, Justice Warts operated a real estate business in Canarsie. He is interred with his wife, Sophia. 95. Weinhold, Charles H. J. (Section 8): Merchant; operated a general store dealing in groceries, hardware and feed at 1536 Rockaway Parkway (building extant but possibly in danger of demolition). He is interred with his wife, Caroline Weinhold. 96. Wilson, William R. (Section 8): Son of Justice of the Peace John M. Wilson. Served as Assistant Corporation Counsel for the City of New York, and from 1940-1945 as a Justice of New York State Supreme Court, Second District. He is interred with his wife, Lillian. My mentor, the late renowned historian, John F. Denton, for inspiring my interest in Canarsie’s history. Gene Lott Potter, whose Canarsie Cemetery web site was instrumental in my research. Anthony DellaRocca, whose 127th New York Infantry (“The Monitors”) web site, which provided substantial information regarding numerous Civil War veterans interred in Canarsie Cemetery. Dolores Barber, MSLIS, CA, Assistant Archivist of the American College of Surgeons, for the information, which she provided, regarding Dr. William H. Rogers, Jr.
Ben DuBose, President Emeritus of the Canarsie Historical Society, for the information which he provided regarding the DuBose family, and for his overall guidance and support in this project. Historian and Author Diana Stuart, for her editorial assistance, and for her overall support and guidance in this project.